In daily busy life we always want some easy recipes to cook fast and they need to be tasty also. 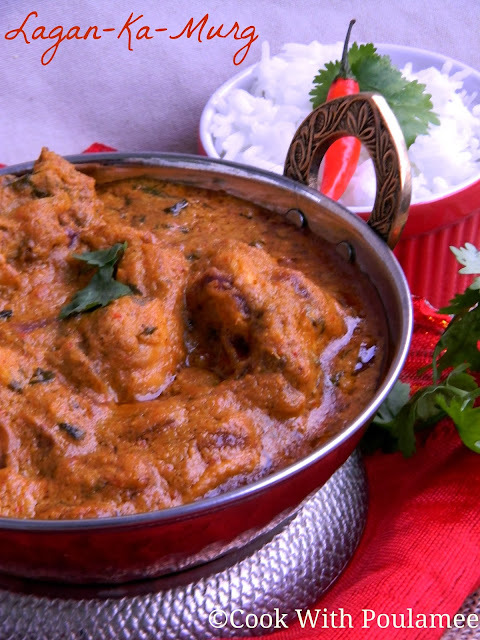 Sometime for guests we don’t get any early notice but any how we want to cook the best dishes form them. In my place most of my guests want chicken in main course. Some chicken dishes need to be marinated for long. So I always want some easy recipe where we don't need to marinate the chicken pieces but the dish need to be very tasty also. 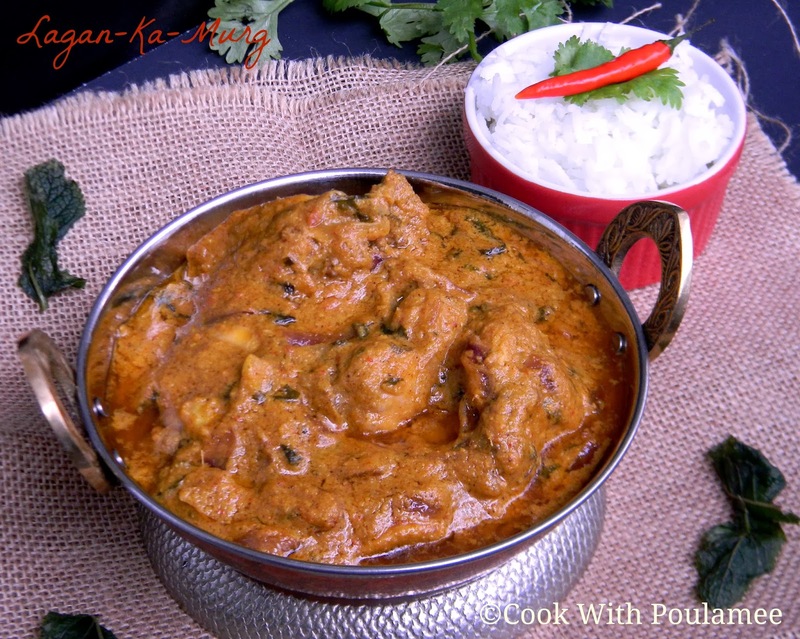 Last night dinner I prepared one very easy chicken curry and you can cook this very fast. The name of this dish is LAGAN-KA-MURG, I learnt the recipe from a cookery show. The specialty of this dish is just making a mixture of all the ingredients and slow cook the chicken pieces on them. 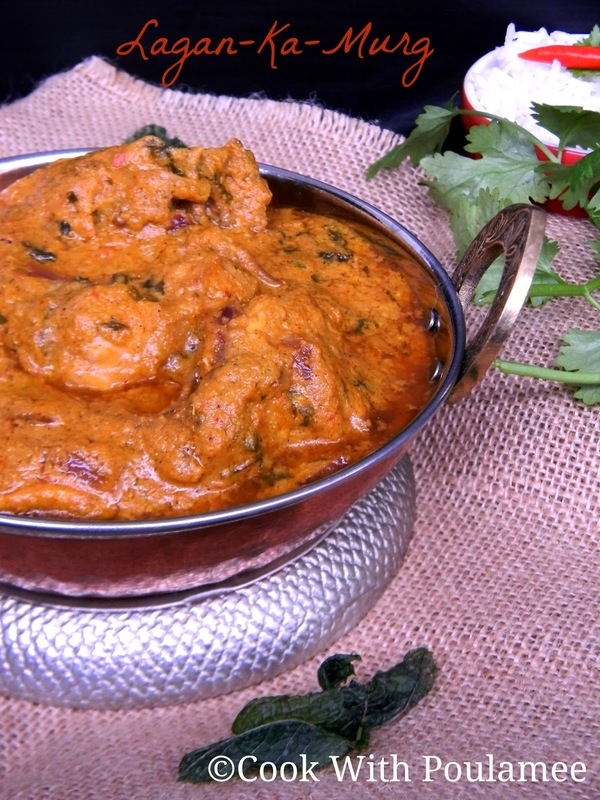 The gravy is creamy and the taste is really royal. Perfect for your guests, and I am sure after having the dish they will plan to visit your place again. 2.One large sliced fried onion. 5.One tea spoon ginger and garlic paste. 6.Poppy seeds: One 2 tea spoon. 7.Cashew nuts: 6 to 8 pieces. 8.Dry coconut: 1 table spoon. 9.Red chili powder: 1 tea spoon. 10.Kashmiri red chili powder: 1 tea spoon. 11.Garama Masala Powder: ½ tea spoon. One small cinnamon stick. 13.Chopped coriander leaves: a hands full. 14.Chopped mint leaves: around 10 to 12 leaves. 15.Ghee or Sunflower oil : 2 table spoon. 16.Salt and sugar as per taste. Wash and clean the chicken pieces, and some salt and keep it aside. Now dry roast the poppy seeds, cashew nuts and dry coconuts and make a paste with some water. Now in a large bowl add the cashew coconut poppy seeds paste then add all the ingredients from no 2 to 16 just add one table spoon of ghee or sunflower oil on it. Mix all nicely. Now rest of the ghee or oil add in a heavy bottomed vessel after it become hot add the cinnamon stick now slowly add the mixture with some water. After it starts boiling add the chicken pieces and cook this in low flame with a lid for 8 to 10 mints. Now remove the lid and cook for another 10 to 12 mints. 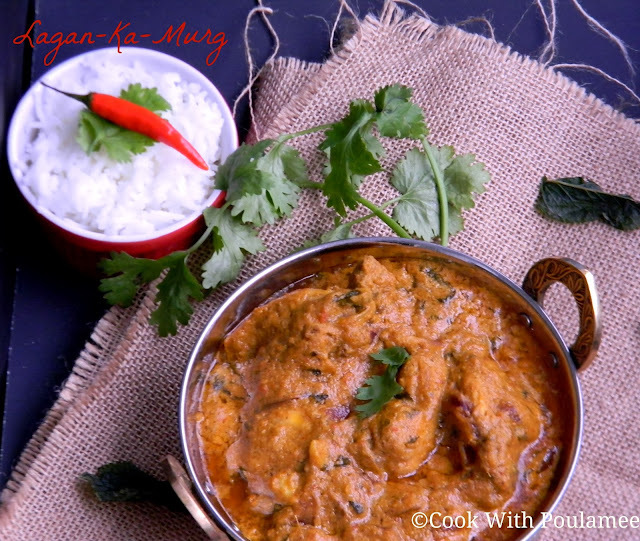 The easy LAGAN-KA-MURG is ready serve hot with NAAN or Plain Roti or any Rice.